Signature, our 1.0 mm flagship brand of laminates, commands a substantial share of the domestic market. Apart from this, we export around 40% of our production to countries across the globe. At Signature, we strongly believe that the only way to sustain & retain our past success is through constant reinvention. We invest a lot on this ongoing process. The Signature brand has gone through an evolution in the past and is today one of the top most brands in the country. The well balanced range of Signature continues to be the preferred choice in a large number of prestigious projects – be it a commercial or a residential interior. It is, in fact, the First Choice of almost every leading designer across the country due to its trend setting designs & exciting Finishes.The Signature range offers an amazing collection of Solids, exclusive Wood effects, a variety of Fancies & Abstracts. These are available in Gloss, Matt and Suede finishes. We also offer an exclusive range of Premium Texture Finishes.Under the Signature brand, the company offers a wide range of thicknesses. Our product range is: Decorative Laminates, Post-forming Laminates, Chalk & Marker Board Laminates, Fire Retardant Laminates/Panels, Interior Compact Panels and UV Resistant Exterior Cladding Panels. At Signature Laminates, we are known for our adherence to schedules. You will get what you need and precisely when you need it! No wonder then Signature Brand has found its way to almost every imaginable application in Interiors and have become the ultimate choice of leading Interior Designers in the country. Signature.. First in Choice! Best in Trends! Post forming laminate is recommended for all furniture surfacing applications where seamless edges are desired. Curved surfaces without the visible seams are more desirable than the sharp edges of the furniture. High Pressure Compact Laminate offered under the Signature brand in the standard size of 2440 x 1220 mm (8'x4') in thicknesses as per the customer's specification. Signature Marker Board Laminates & Chalk Board Laminates, (dry wipe grade), come with the convenience of zero maintenance & long lasting writing boards for schools, colleges, shops, shopping malls, conference rooms, hotels, hospitals, etc. and now a days, even at homes. Signature’s anti-static laminate negates static build up. This is an important property to static sensitive electronic equipments and assembly areas for electronic products. Added advantage is anti-static laminate has lower dirt retention. Signature Scratch Resistant grade has high resistance to impact, scratching and abrasion. 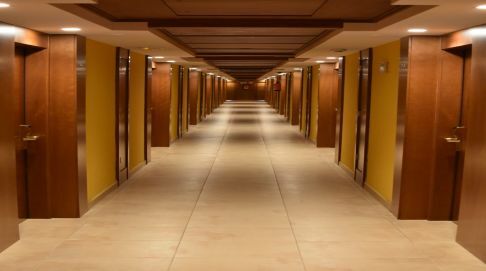 This SR grade is most ideal for use in high traffic areas like hotels. HPL Panels with its unique characteristics are the ideal material for interior furnishing. It is the apt material for a variety of applications like wall paneling, cabinets. Cubicles, lockers, doors, table tops, class room furniture, etc. We also manufacture superior grade Signature Fire Retardant Compact Panels in different thickness. In the event of fire, it does not spread flame, does not melt or drip, and does not emit smoke or any toxic gases. Because of its FR property, this unique product is strongly recommended for the following application areas. Signature Exterior Cladding Panels (ECP) is brought to you by Signature Laminates Pvt. Ltd. one of the leading manufacturers of High Pressure Laminates. This Sturdy architectural panel is ideally suited for exterior cladding of ventilated facedes & balconies apart from a host of other exterior applications. The Signature ECP is a homogenous panel with a high UV surface protection for external use. It is weather resistant. Does not warp. No fading or aging.